I've been wanting to try a pair of socks for a while, so I went to a wool shop to get myself sorted. After only ten minutes I found myself leaving the shop with wool, needles and a pattern that I wasn't really sure I'd chosen... It's amazing what a very pushy sales assistant can have you purchase. The one thing I was sure about were the colours in the socks, so at least I came out with that right! 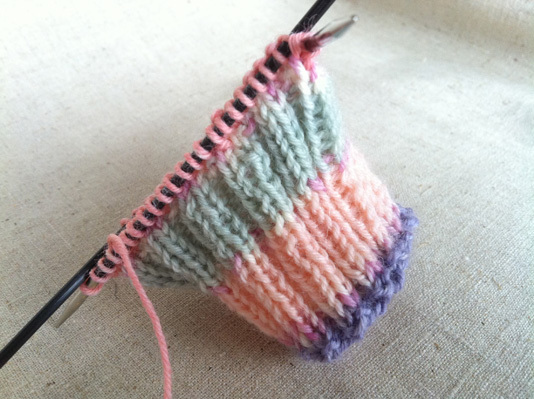 The yarn itself is a German brand Schoppel – a self-patterning intarsia that's made for socks. I bought the rose lavender colourway. The needles are apparently 'change your life' needles, and they'd want to be at the price, but to be honest, having not knitted socks before, I'm unsure what they're an improvement on, though in general I'm not too keen on needles that have a join as they always catch at some point. But it's the pattern I've struggled with the most. Even in the pattern photo the socks looked a bit lumpy and ill-fitting, not the smooth, comfy socks I was imagining. Seriously, I got just past the point shown in the photo below about four times and then every time I undid it because it didn't look right. 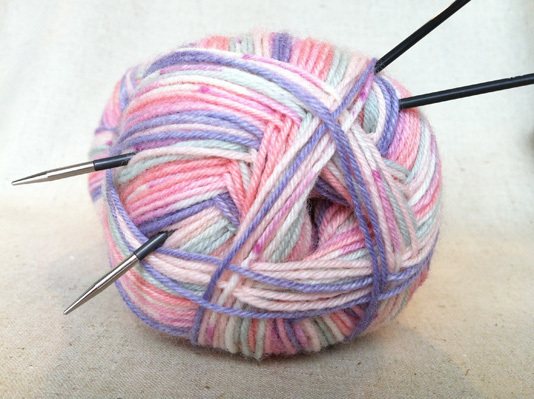 Then the marvellous online knitting community saved the day. One of the bloggers I follow regularly uses a pattern that I liked and mentioned it was on Ravelry. So, over I popped, and guess what? It's free! The patten is called 'A Nice Ribbed Sock' – it even sounds comfy doesn't it? So now I'm on a roll. Stay tuned for progress! Very pretty yarn colors! That will make lovely socks. I hope the pattern is user friendly.